The report in the Spirit of the Times of 25 Mar. 1871 says that ten games had been played (out of 12, since each pair was to play 3). However, it also says of the Howe-Holt match 'a game and a draw each, and a game still progressing', which sounds like +1-1=1, but then there would be no need for a 4th game. The Ascher-Champion match it says was in 'the same state of affairs'. The Spirit of the Times of 8 Apr. 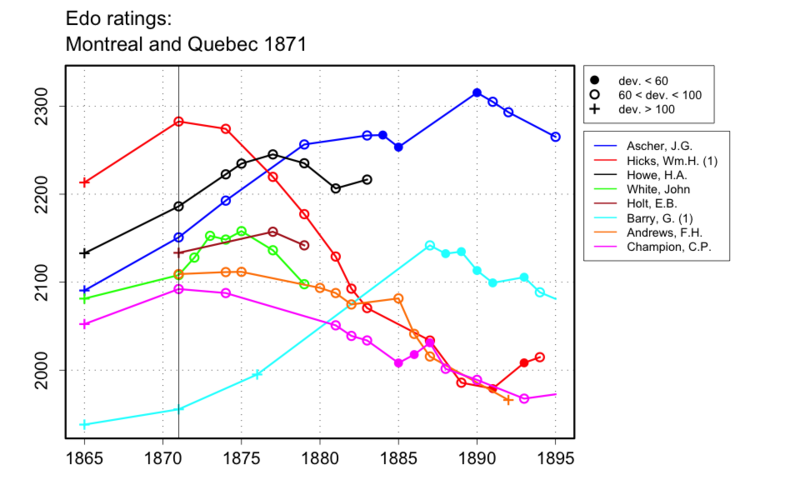 1871 says that 12 games were played, Montréal winning +5-4=4. This gives a total of 13 games, so presumably, the number of draws was still 3, and indeed, the scores of Howe-Holt and Ascher-Champion each finished +1-1=1. The Canadian Illustrated News of 18 Mar. 1871 says the match began on 1 Mar. 1871. Also, The Globe of 2 Mar. 1871 (p.1) gives a report from Montréal dated 1 Mar., indicating that the match was to begin that evening. The Globe of 17 Mar. 1871 says Montréal had won, giving the result +5-2=3, like the first Spirit of the Times report. Thanks to Walter Chan for all these references.